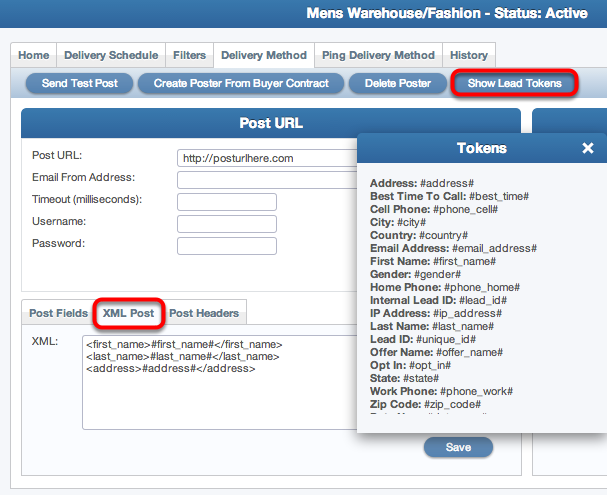 The Posting Document your Buyer has provided you will be implemented in the Delivery Method Tab in the Buyer Contract. CAKE supports several posting methods including Email Delivery, POST, GET and XML. CAKE also supports custom headers if necessary. - Posting leads to Buyers via Email, POST, GET and XML. - How to map Responses from a Buyer. 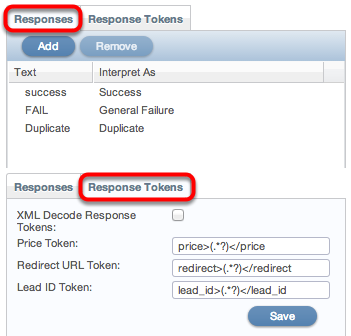 - How to use dynamic Response Tokens. CAKE supports 1 or multiple email addresses for the purpose of delivering leads. Custom lead email templates can be made in Setup > Email Templates. You will then select the email template you wish to use to send leads to that Buyer on the Home tab of the Buyer Contract card then the Post Information section. If your Buyer only received leads via email you will not need to setup any post delivery information. POST Method: The POST Method is the most common form of posting leads to a Buyer. The Posting Document from the Buyer will outline which method to use, if the Buyer allows multiple methods, CAKE would suggest using the POST Method. Post URL: The Post URL is the URL that your Buyer has provided to you as the destination for the leads. The Post URL will be placed in the Post URL field. Username and Password: The Buyer may require specific credentials to be used to access their server. This is NOT where you hard code a field such as Affiliate ID or a specific password that would be used as identification. Once the Post URL has been placed, click “Save”. The Post Fields section is where you will input the fields specified on the Posting Document your Buyer has provided to you. Each field will map to a CAKE Vertical field. To add a field, click “Add”. Query: This check box will only be used if the Buyer has specified they need to be posted leads using the GET Method. Parameter: The Buyer-specific field found on the Posting Document will be placed in the Parameter. For example, the Buyer may receive a user’s address as “address”. Field: This drop down will contain all basic fields and Vertical-specific fields. Choose the corresponding field from the Vertical that matches your Buyer’s field. Condition Formula: Please consult your Trainer or Account Manager for more advanced methods. Once the field has been added, click “Update”. The Buyer may ask that a field should be hard coded, or static. You can accomplish this in CAKE by typing the field name found on your Buyer’s Posting Document followed by an “=” followed by the value. For example, your Buyer may require an Affiliate ID to be submitted with each lead. Every Post will contain affiliate_id=777. Nothing will be specified in the Field drop down. Multiple fields can be static. Situations arise where the Buyer expects the data to be sent differently than how it was received in CAKE. CAKE can handle this by using a Vertical Field that is using a List Data Type. Lists allow data to be received as one value and to be submitted to the Buyer as a completely different value. The Field Name will turn into a hyperlink if the Data Type is “List”. Clicking the name of the field will open a Mapped Values Card. In our example above, CAKE receives the lead as either “Female” or “Male” but the Buyer receives the data as either “1” or “2”. Responses: Responses allow CAKE to interpret the various messages the Buyer will send back to CAKE once a lead is submitted. Text: The Text field allows you to type in a string of characters that can be expected from the Buyer after a lead is submitted. Responses usually include a “Success” message, an “Error” or possibly a “Duplicate” message. Interpret As: This is a drop down that contains values that can be mapped to the Text field. This includes “Success”, “General Failure”, “Duplicate” and others. 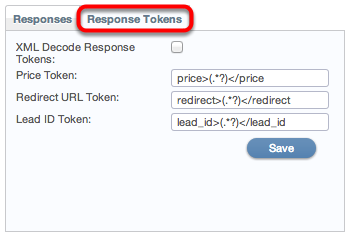 Response Tokens: The Buyer has the ability to pass back specific values in the response if the lead was successfully sold. CAKE can use Regular Expression to determine the exact value being passed in the response. These values include: Price, Redirect URL and Lead ID. Price Token: The Price Token allows a Buyer Contract to receive a dynamic price as opposed to a predetermined price. Redirect URL Token: The Redirect URL Token allows a Buyer to send a specific URL of where they would like to redirect the user. This is used in very specific situations when using the Host-n-Post Offer. Lead ID Token: The Lead ID Token allows the Buyer to pass back the Lead ID from their system. This is similar to the Transaction ID on a 3rd Party Offer. Note: Responses must be mapped and a success received in order for tokens to be captured. *** The syntax used in the image above are just examples. Every Buyer is different in their response. GET Method: The GET Method is very similar to the POST Method. You will use the GET Method when the Buyer specifies this method on the Posting Document. Technically, the lead will be sent in the query string of the Post URL and therefore CAKE will automatically add a “?” to the end of the Post URL. Post URL: The process for placing the Post URL is the same as the POST Method. It does not matter if there is a “?” at the end of the Post URL as CAKE will handle the URL appropriately. Field data will be added to the Post Field section just like we did for the Post Method. Query: The Query check box will need to be checked for the GET Method to function. You can verify that the check box has been checked when the dot turns from red to green. The rest of the process is identical to the POST Method. XML Post Method: The XML Post Method is yet another method of posting lead data to your Buyer. Again, the Buyer will specify this method on the Posting Document. Post URL: The XML Post Method also requires a Post URL. The process is the same as the POST and GET Methods. The Posting Document usually outlines an example of the exact XML Post the Buyer is expecting. This example should be pasted into the XML Post section. Often times the example will include sample data such as the image below. Fields can be hard coded, or static. The static value needs to be placed between the XML fields such as <first_name>JOHN</first_name>. Every lead will contain JOHN as the first name. Similar to the POST and GET Methods, XML fields will need to be mapped to a CAKE Vertical field. This task is accomplished through the use of Lead Tokens. Lead Tokens: Lead Tokens accomplish the same thing as selecting the Vertical field from the drop down on a POST or GET. The tokens will be placed between the XML fields. CAKE can handle the mapping of List values as exemplified on the POST Method when using the XML Post Method. Using the example of “gender”, place the gender lead token between the gender XML fields. In the Post Fields tab, type the name of the XML field in the Parameter (excluding the brackets). Map this field to the correct Vertical field in the Field drop down. Click the name of the field and map the fields to the value your Buyer is expecting. The Responses will need to be mapped the same way for POST, GET and XML methods. 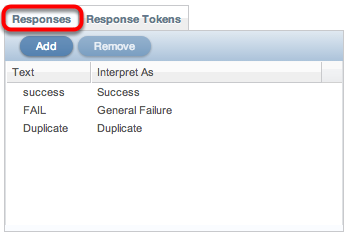 Similarly, the Response Tokens are mapped the same way.